Bloggers respond to AIMs' proposals. If our society is ruled by two different sets of laws – or laws applied selectively – for different people or political parties, it cannot but fracture and disintegrate. Barely two weeks after he announced more space for political expression, Prime Minister Lee Hsien Loong and his colleagues from the People’s Action Party (PAP) could very well have just shown what this ‘openness’ mean – for the ruling party. On Sunday, the PAP Community Foundation organised a ‘PAP carnival’ at West Coast Park. 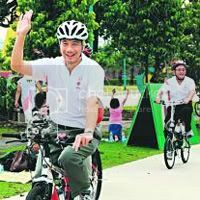 This was reported by the Straits Times on its front page, with a big picture of PM Lee on a bicycle. The event would be nothing out of the ordinary if not for one small detail: outdoor events by political parties are banned – or at least that is what the PAP Government itself says. This was explained in no uncertain terms in Parliament last year (2007) by the Senior Minister of State for Law and Home Affairs, Professor Ho Peng Kee, and carried in news reports by our mainstream press. The ban, said Minister Ho, is a ‘longstanding one’ because ‘outdoor gatherings by parties have the potential to cause a public disturbance.’ (Straits Times). The East Coast Park is a recreational park for Singaporeans and their families. It is not meant to be used by a political party to promote its cause. Apart from displacing the usual recreational users…it is an open area where there is greater potential for breach of the peace, public disorder and unruly behaviour. … even if the organisers were well behaved, others there might still cause problems. You may be well-behaving, but there may be other people whom you come across when you cycle who may stop you, may want to debate with you and that may attract a crowd, and therefore will result in problems the police want to avoid. He said that police required political events to be held indoors or in stadiums where problems could be contained, adding that the WP could consider these venues. The policy applied to all political parties. While we may criticise the Government, the PAP, Minister Ho or even the police, for this seemingly biased application of the law, there is a wider and more important issue which such selective application of the law throws up – and this is; are we seeing a Government which would, apparently, disregard the law when it suits its purpose; what impact will this have on the wider society? On what moral authority would the Government be able to require everyone else to adhere to and obey the law if it does not do so itself? Sadly, such behaviour by the ruling party can only breed further resentment and cynicism not only among its dissenters but also increasingly among those who have supported it as well. As we said in an earlier article on the way the Government explained away the Mas Selamat escape fiasco, the Government’s lack of accountability is bad for the PAP but worse for Singapore. For if our society is ruled by two different sets of laws – or laws applied selectively – for different people or political parties, it cannot but fracture and disintegrate. The PAP would do well to remember that a leader whose moral authority is questionable is one whom no one respects. Ironically, the slippery-slope argument which Minister Ho used to explain and justify his rejection of permits for other political parties, in the end, could result in his own PAP sliding down that slippery slope itself.